Lion Guard, The: Return of the Roar (television) A Disney Channel Original Movie, premiered on Disney Channel on Nov. 22, 2015. Kion, Simba, and Nala’s second-born cub, discovers his destiny: to lead the Lion Guard, a team of the Pride Lands’ fiercest, bravest, fastest, strongest, and keenest of sight, charged with protecting the savanna. 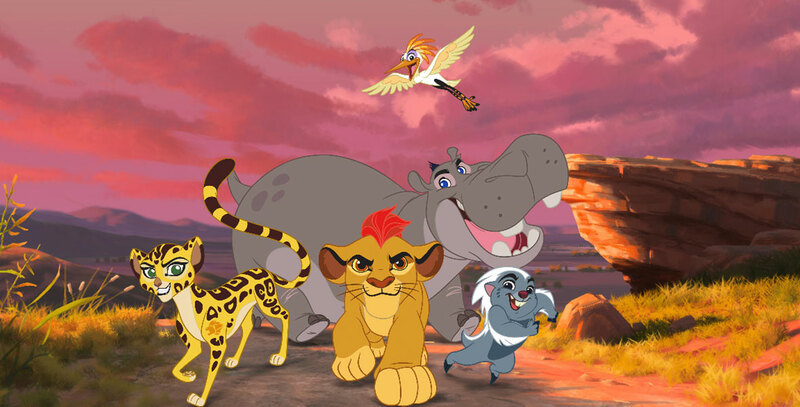 Kion comes up with a very diverse group: Bunga, the honey badger, is the bravest; Fuli, the cheetah, is the fastest; Beshte, the hippo, is the strongest; and Ono, the egret, is the keenest of sight. Directed by Howy Parkins. Voices include Max Charles (Kion), Joshua Rush (Bunga), Atticus Shaffer (Ono), Diamond White (Fuli), Dusan Brown (Beshte), James Earl Jones (Mufasa), Ernie Sabella (Pumbaa), Rob Lowe (Simba), Gabrielle Union (Nala). From Disney Television Animation.